The Oysterman’s Knot (also known as the Ashley’s Stopper Knot) is a stopper knot developed by knot expert Clifford Ashley. 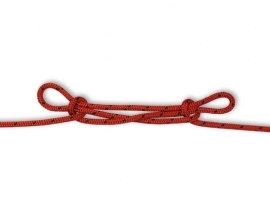 It is quite a bulky knot, good for stopping a rope from slipping through larger holes. It is also quite heavy, making it good for throwing and a possible replacement for the Monkey’s Fist. 1. Make two crossing turns, the left one larger than the one on the right. Make sure the working end and standing end lay underneath the two crossings. 2. Take the left loop and tuck it through the right loop, back to front. 3. Tuck the working end through the newly formed loop, back to front. 4. Dress the knot by pulling both ends into opposite directions. I don’t find OYSTERMAN’S KNOT easy to Dress near the end of the working end to use as a Monkey Fist and does not carry the mass to replace the Monkey Fist.